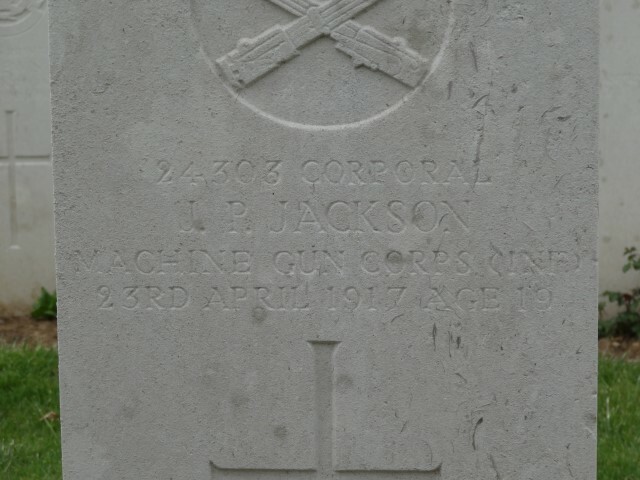 24303 Corporal J.P. Jackson, 151st Company, Machine Gun Corps (Infantry), was killed in action 23 April 1917 and is buried at Wancourt British Cemetery. He was 19 years old and is commemorated on Butterknowle War Memorial and the memorial plaque in St. John the Evangelist Church, Lynesack. In 1901, the family lived at the Engine Yard, Butterknowle and 25 year old William worked as a coal miner (hewer). 31 year old Ellen died in 1906. By 1911, Eleanor Hall was William’s housekeeper at the family home in Essex Row, Butterknowle. 45 year old widower William was a coal miner (shift man) and none of his 4 children are recorded as in employment. 13 year old John was at school and 16 year old Linda lived with her uncle and aunt, John and Elizabeth May at Billy Row near Crook. .
John Percival Jackson enlisted at Cockfield into the 6th Battalion, the Durham Light Infantry the local Territorial Force and was given the regimental number 2021. At some time later he was transferred to the 151st Machine Gun Company and was promoted to Corporal. He entered France 19 April 1915. 23 April 1917: the British launched an assault east from Wancourt towards Vis-en-Artois. Elements of the 30th and the 50th Divisions made initial gains and were able to secure the villages of Guemappe but could not advance further east and suffered heavy losses. Farther north, German forces counter-attacked in an attempt to recapture Monchy-le-Preux but troops from the Royal Newfoundland Regiment were able to hold the village until reinforcements from 29th Division arrived. British commanders did not push forward in the face of such stiff opposition and the attack was called off the following day, 24 April. The following details are from the Divisional History. There is no mention of any specific action taken by 151st MGC. 24 April: during the early morning, 151st Brigade relieved the 150th Brigade who moved back into reserve at The Harp area. “22.4.17 & 23.4.17: Coy again taken the field apposite WANCOURT. 2 sections fire during artillery barrage& push on afterwards. 24.4.17: Only 2 guns can be manned. 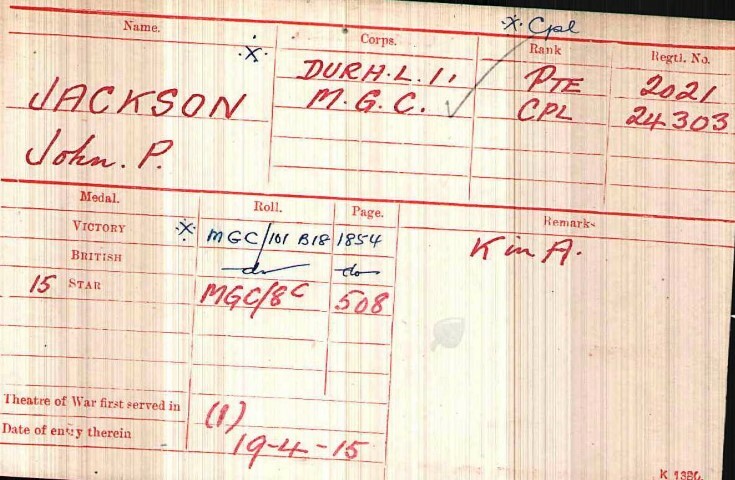 Corporal J.P. Jackson was killed in action 23 April 1917. He was 19 years old and had been “in the thick of it” for 2 years. He was awarded the 1914-15 Star, the British War and Victory medals. Corporal J.P. Jackson is buried at grave reference I.A.18 Wancourt British Cemetery. Many burials from small cemeteries and the battlefields were brought into this cemetery after the Armistice. The cemetery contains 1,936 Commonwealth WW1 burials, 829 remain unidentified.